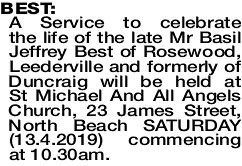 A Service to celebrate the life of the late Mr Basil Jeffrey Best of Rosewood, Leederville and formerly of Duncraig will be held at St Michael And All Angels Church, 23 James Street, North Beach SATURDAY (13.4.2019) commencing at 10.30am. 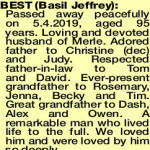 To Merle, Judy, David, Tom, Rebecca, Tim, Rosemary, Genna, and great-grandchildren, our sincere condolences for the loss of your dear husband, father, father-in-law, grandfather and great-grandfather. With best wishes from the Frigger Family. A brilliant teacher of our class 3T at Mt Lawley High School in 1959. 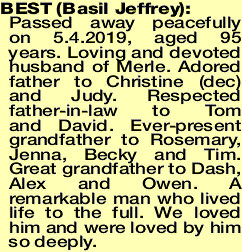 BEST BASIL JEFFREY Passed away peacefully on 5.4.2019, aged 95 years. Loving and devoted husband of Merle. Adored father to Christine (dec) and Judy. Respected father-in-law to Tom and David. Ever-present grandfather to Rosemary, Jenna, Becky and Tim. Great grandfather to Dash, Alex and Owen. A remarkable man who lived life to the full. We loved him and were loved by him so deeply. Boss, you were the best father I ever had. With Christine now. You will be missed. Love always, Tom. Dad, you were adored by us all. You lived a full life, always thinking of others, but your family was your focus. We will miss you terribly but the memories are everywhere - the jokes, the laughter, the little things you did for us. Until we meet again. Love always, Judy, David, Becky and Tim. Dearest Poppie, we will always cherish our memories of time spent with you, at home and especially on our many shared holidays. Always giving of your time and attention, it was wonderful to have you as our grandfather and Dash, Alex and Owen were so lucky to have you as their great-grandfather. With love always, Rosemary and Jenna. Extended family member and friend of the Hartree family. 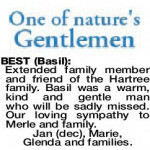 Basil was a warm, kind and gentle man who will be sadly missed. Our loving sympathy to Merle and family. Jan (dec), Marie, Glenda and families. 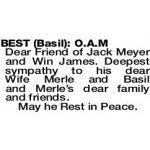 Dear Friend of Jack Meyer and Win James. 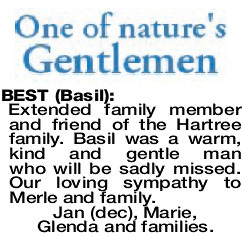 Deepest sympathy to his dear Wife Merle and Basil and Merle's dear family and friends. 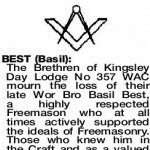 The Brethren of Kingsley Day Lodge No 357 WAC mourn the loss of their late Wor Bro Basil Best, a highly respected Freemason who at all times actively supported the ideals of Freemasonry. 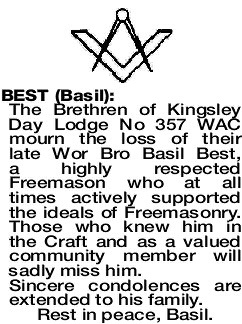 Those who knew him in the Craft and as a valued community member will sadly miss him. 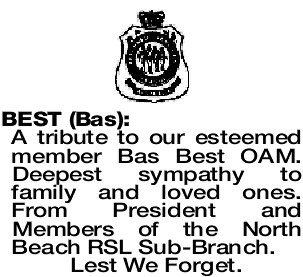 A tribute to our esteemed member Bas Best OAM. Deepest sympathy to family and loved ones. 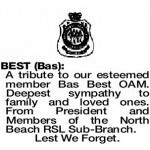 From President and Members of the North Beach RSL Sub-Branch.